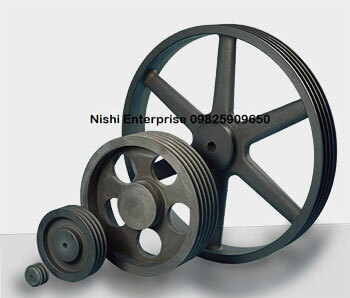 Nishi Enterprise is a leading manufacturer of different kinds of pilot bore pulleys which can be used for diverse industries and applications. Our pulleys come in a wide range of sizes. Every pulley that we have to offer undergoes stringent balancing tests so as to make sure that every pulley functions in the most efficient manner. We also experiment with different working methods as this allows us to create top quality pilot bore and solid pulleys for our domestic and international clientele. We also practice a strong policy of quality check to make sure that our pulleys are the best in the industry. These pulleys are always finished with a black coating which serves as a primer which can help in protecting the pulleys from adverse environmental factors. Our range of pulleys covers SPA, SPB, SPC and SPZ circumferential speeds that go up as high as 40 m/sec are permissible. Here is a look at the types of pilot bore & solid pulleys that we can provide you with. These are pulleys that come in a range of various diameters and are combined in one single concentric unit. The step pulleys are used for varying the velocity ratios of shafts. The step pulleys are used in applications where the variations from the slow rotations to the high rotations are required with a change of torque. In some cases these pulleys are also referred to as cone pulleys. The V-Belt Pulleys are also sometimes referred to as V-Groove Pulleys or Light weight Pulleys. They can be used for transmitting power for specifically low weight applications. The V-Belt Pulleys are generally used in applications where their rotation is comparatively less and the moving parts that are connected to the output shafts are very light. These pulleys are usually made from cast iron materials. Being an industry leader when it comes to creating pilot bore and solid pulleys in India, we leave no stone unturned when it comes to offering state of the art products. Here are the distinct advantages of using our products.